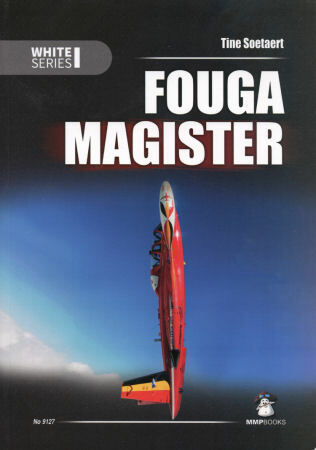 With nearly 1000 produced, distinctive butterfly-tail CM-170 Fouga Magisters rank among the world’s classic combat jets. They served as trainers and light strike aircraft in at least 22 air forces. And France, Finland, Germany and Israel manufactured the machine. Now I just found the perfect reference for Kinetic’s new 1:48 CM-170 kit. Fouga Magister – number 9127 in MMP’s “White” series – includes dozens of B&W and color photos, 1:72- and 1:48-scale plans, close-up shots, interior details, technical-manual excerpts and 35 lip-smacking color profiles. Author Tine Soetaert also treats readers to a whirlwind tour of the aircraft’s design, development and operational service. Did you know that the design’s long, narrow-chord wing reflects its glider roots? Over 132 lavishly illustrated pages, readers enjoy, in short, everything needed to trick-out their favorite Magister models. But that Ugandan roundel proportion looks wrong. Building Airfix’s 1:72 kit? Tackling Heller’s ancient 1:50 effort? Try finding a better English-language Magister monograph. With thanks to Casemate for the review copy.